It awards the Nobel Prizes in science and proudly portrays not a political figure but one of its most eminent scientists, botanist Carl von Linné (1707–1778), better known to the world as Linnaeus, the father of biological nomenclature, on its ubiquitous 100-kronor note (about $16). So it is hardly surprising that Sweden is the home of a large and vibrant skeptics group and was the able host of the 2013 European Skeptics Congress (ESC), August 23–25, in Stockholm. 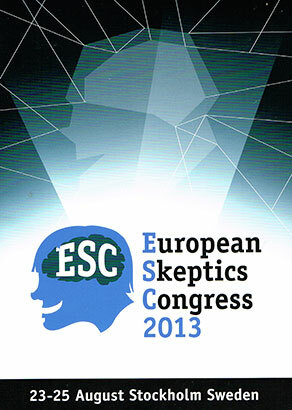 The fifteenth in the series of biennial congresses created by the European Council of Skeptical Organizations (but first in Scandinavia), ESC 2013 featured speakers from ten countries and plenty of time for socializing and networking. Martin Rundkvist and P.J. Råsmark of the Swedish Skeptics officiated and kept things running smoothly. 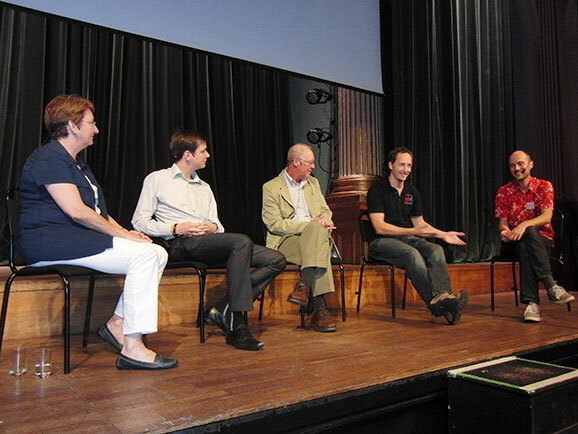 Most all the usual academic topics were covered, but there were also magicians and even Sweden’s first astronaut, PhD physicist and CERN Fellow Christer Fuglesang of the European Space Agency, a veteran of two space missions to the International Space Station (including five spacewalks totaling nearly thirty-two hours), in 2006 and 2009. He proudly noted he has been a member of the Swedish Skeptics almost from their beginning, in the early 1980s. In his lively presentation of phenomenal photos of Earth from space he included one of himself wearing an “Always Be Skeptical” T-shirt while peering down at Earth from the International Space Station. Physician and statistician Hans Rosling (Karolinska Institute) and his son Ala Rosling jolted attendees’ preconceptions from the start with their “fact-based worldview with animated data.” Founders of the Gapminder Foundation, which develops the Trendalyzer software system for visualization of statistics, they took the audience through rapid-fire animated displays of world demographic trends. Much of what we think we know about world population trends is wrong, they told us, and then demonstrated, first using an instant electronic feedback system to take the audiences’ answers to a series of questions and compare them with reality. Today half of the world’s population is in Asia and Africa, but by the year 2100 that figure will leap to 80 percent. “CEOs know this better than academics,” said Hans, a bow to the practical value of modern demographic knowledge. A dramatic new reality has set in. Whereas couples used to have on average six children of whom four died, the new balance is now two kids per couple, with most of them surviving. This dramatic decline in babies born per woman is true of all religions and regions. Europe just started doing it earlier. As a result world population will continue rising but not at the steep rate predicted three or four decades ago. Max Maven, the mentalist and illusionist, gave both a lecture where he praised somedeception (“art is a beautiful deception”) and later a two-hour evening performance. Even our audience of skeptics found ourselves repeatedly mystified (but with no implication of paranormality), a good lesson for everyone. Magician Tom Stone (Sweden) continued that theme. He showed and then patiently explained some of the psychological and perceptual principles behind creating some illusions. “So now you won’t be fooled,” he added wryly. He then performed them again, and fooled everyone again. Neuroscientist Beatrice Mautino of Italy’s CICAP skeptics group emphasized the value of solving mysteries to learn science (and vice versa). She said skeptical investigation can kill three birds at once when it not only solves a mystery but explains some scientific facts (like the physics of firewalking) . . . and then goes on to tell something about how science works. Hands-on activities are especially productive. CICAP takes people out to make their own crop circles (they start with thirty-meter-diameter circles) or test “the blood of San Januarius” or lie on a bed of nails. As for assertions about an Apollo landing hoax, she and her colleagues go through the evidence for that, and then ask people to investigate and test the claims themselves. This seems to be an effective strategy. Shane Greenup (Australia) reinforced that theme. Instead of telling people they are wrong, he urges leading them to question the belief using the Internet to find the right information. And that right information could come via his Rbutr.com software. You install Rbutr in your browser and it finds rebuttals to extraordinary claims. Skeptics can establish a link from any web page making a claim to the rebuttals of their choice. Psychologist Tomasz Witkowski (Poland), familiar to our readers from several recent pieces in SI, gave a nuanced talk addressing the question of whether the social sciences are what Richard Feynman called a “cargo cult science.” Witkowski has his criticisms of social science—too much of it deals with unimportant topics, and its surveys often use students and other biased samples. But he ultimately came down in defense of the social sciences, which he said have great hidden potential. One example is the research that showed that adding a third brake light on the rear of vehicles would drastically reduce accidents and injuries, or that emergency vehicles should be painted lime green to be most easily seen—practices, along with many advances in passenger airline safety, that have now been widely adopted and save lives. Dr. Catherine de Jong (Netherlands), an anesthesiologist, addiction researcher, and president of the Dutch Society Against Quackery, described pseudoscientific addiction treatments that contradict treatments based on science. These questionable treatments include the Prometa protocol , disulfiram injections, and Ibocaine. The latter is described as “a naturally occurring psychoactive substance found in plants in West Africa,” implying that since it is natural it is safe. Ibocaine use carries a high risk of heart arrythmias and death, and it has been forbidden in the USA. Some of these addictions treatments claim FDA approval (but any approvals are not for addiction treatment) or “almost 100 percent success” or offer a dubious hypothesis about the working mechanism. Good science, better cooperation among health authorities, and investigative journalism all can help get rid of such pseudoscientific treatments. Anna Bäsén gave many examples of such investigative journalism. A medical reporter for a leading Swedish daily newspaper, she specializes in undercover health journalism, going undercover to nursing homes or alternative medical practitioners (such as a health coach who claimed you can cure deadly viruses with positive thinking) or psychics (she got a cold reading of “one of my not-real dead relatives”) and then simply reporting what they say. Undercover medical journalism shouldn’t be used recklessly, Bäsén says, but “I also get upset when people get ripped off.” Her published exposés have put some of these people out of business. Science teacher Dénis Caroti (France) described teaching about intellectual self-delusion in France (where the word ”zetetics” rather than “skepticism” is used to avoid the negative connotations of the latter). He touted physicist and CSI Fellow Henri Broch’s Laboratory of Zetetics at the University of Nice, Sophia, where critical thinking is an official skill to be acquired by students. On the final morning, Chris French (United Kingdom) gave a survey of anomalistic psychology (also the title of his forthcoming book), Hayley Stevens (United Kingdom) described some of her experiences as a skeptical ghost hunter, and I ended the conference with a talk on “Why We Do This: The Higher Values of Skeptical Inquiry” (to be published in the November/December 2013 Skeptical Inquirer). There was more, a lot more, but you get the idea. For three days in Stockholm science and skepticism were the central theme of stimulating intellectual discussion and exchange. Young skeptics were everywhere and lent vigor and freshness. And until there is a Nobel Prize in science-based skepticism or a distinguished skeptic makes it onto some nation’s currency, that will just have to do. Blowfish Hangover Remedy: Scam or Savior?